We set up Sausage Pals after having difficulties finding a weekend dog sitter in the local area. Having two mini dachshunds ourselves (Bisto and Darcy) we know that they prefer the company of their own breed. With that in mind a dachshund only weekend daycare seemed like the perfect idea. By having a dachshund only home we aim to give your sausage the most comfortable day away from you possible. 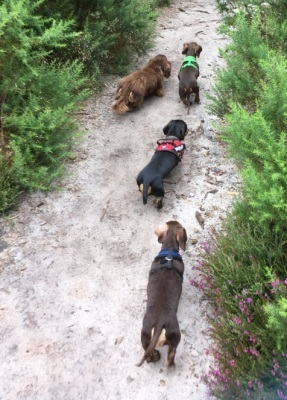 We welcome all dachshunds - mini, tweenie or standard. From playful pups right through to senior snugglers! 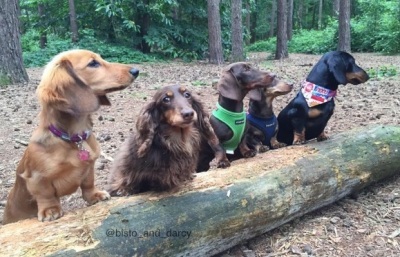 Through our rehomed dachshund Bisto we have experienced the highs and lows of owning this amazing breed. Bisto has suffered from back issues, with the first time resulting in emergency surgery at the Supervet and extensive after care and rest. Due to this we have a great deal of knowledge in this area, and will ensure your dachshund is looked after as safely as possible. Bisto did not have a good home before he came to us, and as such we have worked hard to turn him from a nervous scared dog, into a friendly happy and loving companion. So don't worry about any quirks your little one might have - we can handle it!